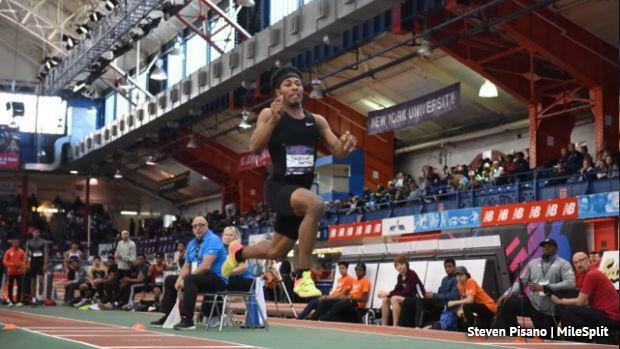 Treyvon Ferguson closed out his indoor track and field career on a high note at New Balance Nationals Indoor. The Milton Hershey senior took second in the nation in the boys' triple jump, though he very nearly ended up a national champion. Ferguson put forth a best jump of 49 feet, 6.5 inches (15.10 meters) in the preliminaries, giving him the lead heading into finals. That jump was an indoor best for him and just off his all-conditions best (49-7) from outdoors last summer. In the first round of the finals, Jequan Hogan from Colorado matched Ferguson's 49-6.5 jump, but Ferguson held the advantage over him with a better third best jump (both boys had the same distance on their second best jumps). Then on Hogan's final attempt, he pulled out a leap over 49 feet once again, giving him a better second jump and lead. Ferguson couldn't match that on his final attempt and Hogan took the win with Ferguson taking second. Despite the narrow defeat, Ferguson was upbeat after the competition, especially considering nationals was just his third time jumping in competition this season. He plays basketball on Milton Hershey's team in the winter. "It's another milestone knocked down," he said. "I'm looking forward to outdoor -- I've been playing a lot of basketball, so I haven't had a lot of time to focus on track, so I can't wait to start that up." The next milestone on his mind is the 50-foot mark as he heads into the spring as the reigning state champion in AAA and looking to repear. He's looking to work on some things before that. "Fixing my third phase," he said is the key to ensuring he reaches those goals. "I struggled with that all my career, so being able to make that adjustment, I can push out a big jump."